Rising rents are a constant topic in NYC – every day, we walk past vacant storefronts left empty, awaiting a drug store or major bank chain that can afford the pricey space. On his weekly #askthemayor segment on the Brian Lehrer show, Mayor de Blasio will address how to support small businesses – policy on which Manhattan Borough President Gale Brewer’s office has long led the way, with their Storefronters Campaign. Yesterday on Brian Lehrer, NYC Council member Dan Garodnick outlined how Council supports a tax initiative for greater affordability (#commercialrenttax) – plenty of support in Council, but hurdles include its relationship to state & federal tax law. When posting your comment, you’ll briefly register a free account with the widely-used Disqus comment system, and then your feedback will be delivered manually by our team to participating NYC Council offices (ten of 51, as of this writing, more welcome). … and register a free account on NYC Councilmatic to get a daily morning digest of notifications for everything you’re tracking in Council – every member, committee, bill, and even complex search queries. 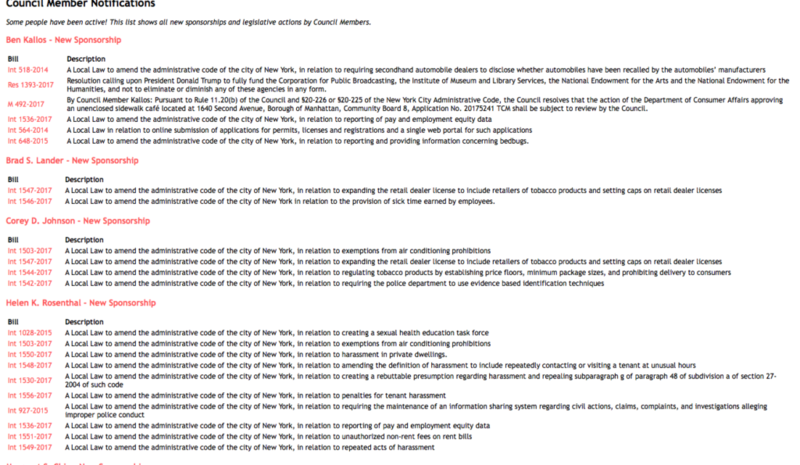 Portion of a daily email digest from NYC Councilmatic, create your own! Wrapping up, another shout-out to office of Manhattan Borough President Gale Brewer for leading the way in community planning with “Small Business, Big Impact” report from March 2015, feel free to get in touch with their team to support economic diversity in NYC. 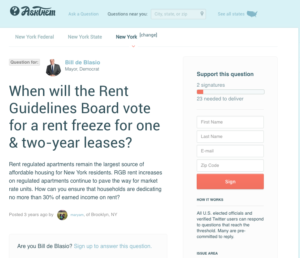 Another free & non-profit site for communicating your feedback to NYC elected officials is our AskThem questions-and-answers platform. AskThem works like a continually-running #askthemayor to Mayor de Blasio, as well as city Council members, state legislators, and many more – designed to be shareable over social media in your community. Get in touch anytime with your questions & ideas, email me: david at ppolitics.org. Hey, we sure could use some charitable funding support to maintain and train community groups and civic watchdogs in using these unique free & open-source tools. NYC digital media partners, feel free to use embeddable widgets anytime you’re writing about city politics, and dash me a screen-grab of your own alert dashboard – showing your use cases will help us make a case to city-engagement foundations to support our public-benefit work.